We met with a group of leaders recently to spend some time together in the presence of the Lord as we move into a new year. The Lord’s presence met us in a tremendously significant way as the Holy Spirit filled our hearts. Many of us found ourselves on the ground overwhelmed by the glory as we ministered to one another—not a bad way to start things out! It was a unique time as we had prophesied many years ago over some of the couple’s there. One couple specifically that the Lord was birthing a ministry through them, and today many years later we are amazed to see how it is flourishing and growing! There were others whom we have also known since the beginning of their ministries, praying and prophesying over their lives as well, as well as encouraging them, and are stoked to see their ministries growing and branching out as well. We also had our annual board meeting recently where again the Lord met us powerfully in what was a time of impartation and fellowship. The Lord imparted faith and vision for the future as well as reflecting on all the awesome things he has done, even over this last year. Mercedes praying for some sisters at the Aglow lighthouse meeting in O.C. 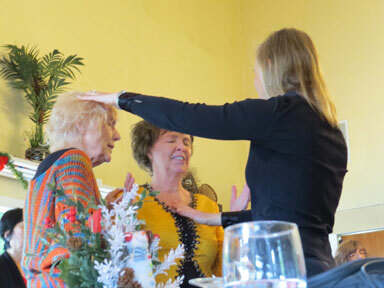 The power of God touched a woman that day who said she hadn’t experienced the Spirit’s power like that since the early days of the outpouring in the Vineyard! 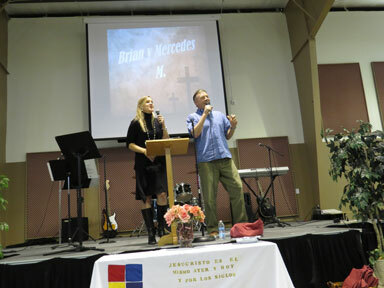 Ministering at Iglesia Misionera Armonia out at the base of the Mountains on the way to Big Bear. Had an awesome time as the Lord met us with His presence and released faith for the New Year and beyond! We ministered out by the local mountains right on the way up to Big Bear at the base of the mountains for the New Year. We were blessed to celebrate the arrival of the New Year with the power of the Spirit falling and filling people, as well as bringing some new ones into the Kingdom who received Christ there when we gave an invitation. We shared about how Argentina had once been one of the hardest countries in Latin America to reach with the Gospel, but then at the end of the twentieth century it experienced one of the biggest revivals, and we’re believing the same for North America. Young girls of around 10 to 11 years old getting powerfully filled with the Holy Spirit as we ministered to them out in the High Desert. The Lord touched their lives in a very deep way which led to other kids gettng filled that day also! 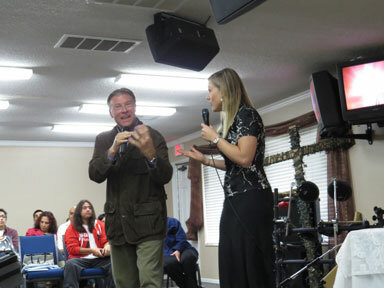 Ministering together at New Life Chapel in Hesperia. The Holy Spirit moved with about 5 people receiving the Lord and many getting filled and some healing taking place too! 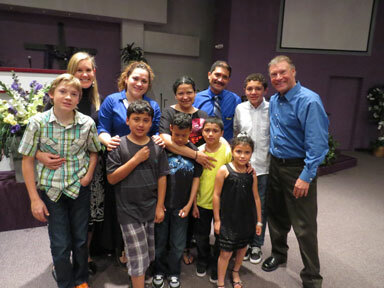 We ministered out in the High Desert area recently and had a great outpouring of the Spirit. Five people received Christ and then many there were filled with the Spirit and received healing. There was also an especially powerful move of God amongst the young children. A few young children started getting filled with the Spirit spontaneously. 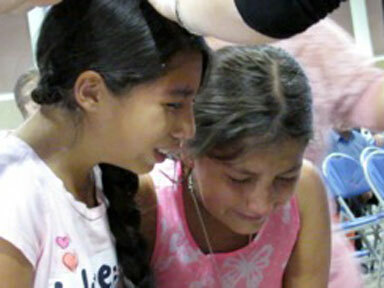 With tears in their eyes they lifted their hands and God’s power filled them as we laid hands on them. More kids came in and many others were touched as well. The pastors Raul and Claudia joined us and together we laid hands on the kids and saw many touched and filled in a glorious way that day. We had prophesied and ministered over these pastors as well years ago, about their call to minister when they were helping out at another church. Now all these years later they have their own church, which is growing and expanding. We were with them back in those days gone by through tough times when they held their services in a hot little garage in the middle of the desert with no ventilation and definitely no air conditioning, with temperatures soaring into the 100’s and above—boy, it was tough to preach in that hot little garage when we would visit—I’d look like I jumped in a swimming pool with my clothes on by the time I was done preaching, I was so sweaty! God’s power and word has caused them to persevere through tough times to a point now where things have grown and it is a blessing to see it. After our time in the desert we were invited to go out to meet some pastors—we had an amazing divine appointment with them not too long ago in the mountains which we wrote about on our blog. After just meeting up to connect and have a bite and get to know each other better, they invited us to stay and preach at their Sunday service. It was a blessing to be ministering out in Mammoth Mountain and see the Spirit of God poured out in such an awesome way. God brought renewal to many and there was a small pile of people left in the front getting hammered by the power of God, and as we were leaving out the front door we could see the presence of God had made a major invasion!! Glory!! The pastor said that the message was “extremely poignant and exactly what they needed to hear at this time, helping them confirm direction in their lives! !” Hallelujah!! It was an awesome time up in the mountains!!! “Wow what power, what is going on? I’ve never experienced anything like this!” These were the words of the wife of an Assembly of God pastor who was brought to the floor by the power of God and was unable to get up after we prayed for her at a recent PrayerFest! We did this PrayerFest meeting with our friends Jeff and Jeanette out in the desert area of Hemet. We were meeting and praying for a few Assembly of God pastors from a church in the area. The presence of God just suddenly invaded and slammed the co-pastor’s wife to the ground and just came on her like fire. She was going, “Oh my goodness! I’ve never felt fire and heat like this ever!” as she laid pinned to the ground overwhelmed by God’s presence, and this was coming from a Pentecostal leader. She got a new perspective from the Lord on the need to focus on healing the sick. Another pastor got touched powerfully as well and received healing in her knees and said she’d never be the same. It was a real refreshing Holy Ghost time and a return for them to that original Pentecostal power. This was followed up a short time later with ministering and praying for a Hispanic couple who was on the brink of separating and divorcing. We all met together (Jeff, Jeanette, and us) with them and with Mercedes speaking Spanish we talked and counseled them for a bit. The Lord kept giving Bryan a word on the need for the wife to forgive her husband. In the natural this felt impossible for her though. However, as I delivered the word, the Holy Spirit came upon her and she was overcome by the Spirit of God and began to weep profusely. The husband that she could barely make eye contact with moments before because she felt deeply hurt, broken, and bitter towards him, she then proceeded to forgive, with tears running down her face as the presence of God came over her and made what is impossible with man possible by God’s grace and power. We have enough broken marriages and families today everywhere. Praise God for the sheer power of the Holy Spirit and mercy poured out to help in the time of need! The Lord is pouring out His presence in these days and we are thankful for your help in helping us: reach the lost, focus the children and adults on the Kingdom by seeing them filled with God's Spirit, and renew and focus leaders in their calling! Hallelujah! We had some awesome times ministering in Healing Meetings earlier in the year where God met many with grace and power and where we saw many touched, ministered to, and received healing power in their lives, including those with shoulder and back pain healed, as well as many filled—both young and old—with the Holy Spirit as well as those led to Christ through outreaches as well as through divine appointments. We had various ministry times at churches where the Holy Spirit fell in such power it was just amazing! (You can get more details in former newsletters here). 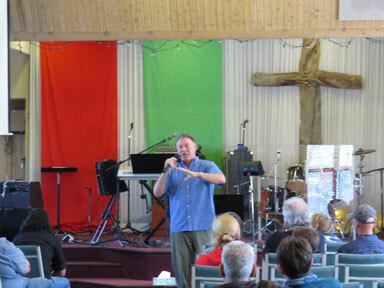 Preaching in B.C., Canada where we ministered at a three day conference. The presence of God met us in a major way with His continual glory, with signs and wonders leading and following the whole way through! Preaching in Mammoth Mountain. We had a powerful divine appointment with the leaders when we were up there on a previous backpacking trip, which led to us ministering there later. The pastor said the message was exactly what they needed at that time! ﻿﻿We also were blessed to minister in Canada for the first time. It was an awesome time. 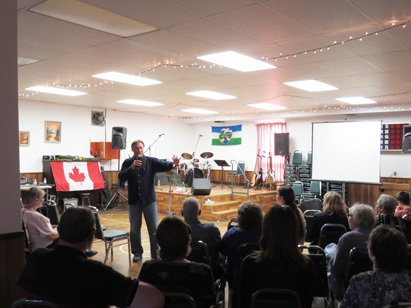 We were blessed to minister in Vancouver and then in Ft. St. John and do a three-day conference there. The Lord poured out His power on young and old and renewed many in the “joy of their salvation!” That joy is infectious. Greek scholar Thayer describes the Greek word used for joy—second fruit of the Spirit by the way—as “an overwhelming hilarity.” John Wesley used to say: A sour faith is the devil’s faith. Well, it was an awesome time in Canada with many filled with the Spirit while others received physical healing. We did experience a bit more than the usual amount of warfare afterwards, including my phone getting stolen and many things breaking down right as we returned home. That just means the devil is mad because of all the Lord did; however the Lord Jesus holds the victory and we march on with Him. We also celebrated our 21st wedding anniversary on the road in Oregon while returning from Canada and had an awesome time together exploring a bit of the famed scenic Oregon coast. We got to enjoy a bit of hiking and biking and some of that awesome Tillamook cheese, it was a blessed time! (You can check it all out on a little video we did of the trip). 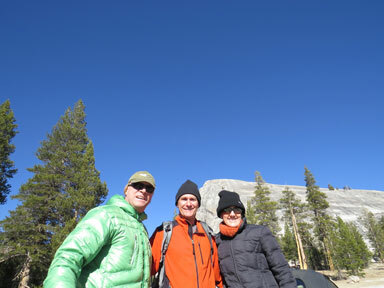 Divine appointment with an Aussie traveler who we met while passing through Yosemite after ministering in Mammoth. He was on his travels seeking more of the Lord and sure got it when we prayed for him!!! Family from El Calvario Church that had a few of these kids receive the Lord and get radically filled with the Holy Spirit that same day when we prayed for them. The whole family was powerfully ministered to! We continue with our radio, Internet streaming radio, regional TV, and online video programs that continue to reach many different people from Latin America (we recently got a powerful response to our programs from El Salvador) to Spain to Canada. By way of example, this is a comment we just received from Ursula P. who watched one of our videos on our YouTube Channel: "Thank you for this presentation in both English and Spanish! This was what I needed on a personal level and what we need now for the souls of this time period." We feel it is time to move forward into a new level and ask you to pray about contributing towards these efforts. We need some new equipment and your support would be greatly helpful towards these efforts. Years ago, while doing my Masters Degree at Fuller Seminary, I realized that there were many important aspects of the Holy Spirit working through history that were being overlooked at seminaries, churches, and Bible Schools—of which we’ve taught in many. We saw the need to produce materials and programs that could communicate in concise yet informative ways, and in a format that was heading where pretty much everything is now: video and audio available on demand, whether you’re watching or listening on your mobile phone or desktop computer. We’ve geared ourselves for the times, and now it is time by faith to shift into a higher gear with what we’ve been producing, so any help you can contribute will reap many rewards. We are working to see the people of God equipped and informed by illuminating how Christ has always worked by His Spirit in various people’s lives throughout all of human history. In the last couple years, as we’ve ministered in some new places for us in North America, including: Montana, Colorado, Canada, and parts of California like Mammoth, Salinas, Santa Maria, Santa Barbara, etc., it seems that the Lord is slowly reawakening the sleeping giant of North America. Historically, more revivals have been experienced and more missionaries sent out from the North American continent than from any other place on earth. This region is long overdue for another Great Awakening and it seems things are slowly starting to ramp up in that direction. Hallelujah! Thank you so much for your prayers and support, it means so much and is greatly appreciated! All God’s blessings as you begin this New Year!